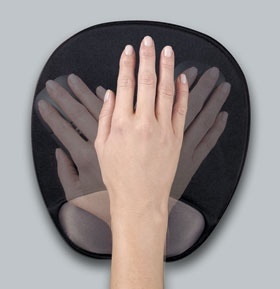 EasyGlide Gel Mouse Pad w/Gel Wrist Rest With Microban® Patented wrist rest mechanism glides freely for optimal positioning to reduce wrist inflection and redistribute pressure points. Durable covering withstands daily wear and tear. Built-in Microban® protection continuously fights bacteria. Allows full movement without picking up mouse to backtrack. Optical-friendly mouse pad with superior tracking control.